"I'm with the band," I announced. I'm with the band, too. Of the "Guitar Hero" ilk. Hey we all have our pipe dreams (mine was never to be in the band) but what the hey!cute Haiku! I think I'm dyslexic, it's 7-5-7, hope to do better next week! 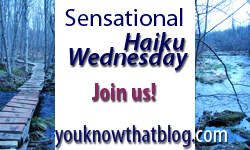 You know that I love that Haiku! I was ne'er quite so clever. Heehee! Awesome! If we ever get our own band for our group, you can totally be in it. Deal? Would love to here the 2nd verse! Never thought of doing a Haiku of a dream! Very creative. Of COURSE you are WITH the band. Would Bad Mom be anywhere else?